I will begin with the verses in Paradiso 29 that are foundational for the analysis carried out in The Undivine Comedy, where my reading is based on the analogy between human thought and human narrative—both subject to time and both forms of “concetto diviso” (Par. 29.81). Dante conceptualizes human experience as a linear path affording encounters with the new, a line of becoming intercepted by newness. We can extrapolate this viewpoint from his treatment of the topic of angelic memory in Paradiso 29.
to recollect an interrupted concept. Angels never turn their gaze from the face of God, in Whom they see all things. Therefore, angels “non hanno vedere interciso / da novo obietto” (79-80): their sight is never intercepted by a new object that comes along the line of becoming (indeed, for angels, there IS no line of becoming!). A further corollary of uninterrupted angelic sight is that angels have no memory, because they have no need to remember concepts that have been interrupted along the line of becoming by other concepts. did not delay in turning toward him. The “novo obietto” of Par. 29.80 requires a mental structure that can accommodate it, and so humans have “concetto diviso”: divided thought. Since we do not see everything all at once, but must see and remember many new things sequentially, “ad una ad una,” we think differentiatedly, discursively, by way of divided thoughts: “per concetto diviso”. The poem’s narrative journey, like the pilgrim’s represented journey, is predicated on a principle of sequentiality, on encounters that occur one by one, “ad una ad una,” in which each new event displaces the one that precedes it. Like all narrative (indeed like all language), but more self-consciously than most, the Commedia is informed by a poetics of the new, a poetics of time, its narrative structured like a voyage in which the traveler is continually waylaid by the new things that cross his path. Life is just such a voyage: it is the “nuovo e mai non fatto cammino di questa vita” (“new and never before traveled path of this life” [Conv. 4.12.15]), in which our forward progress is articulated by our successive encounters with the new. The opening simile of Paradiso 29 is worth paying close attention to, even though difficult. 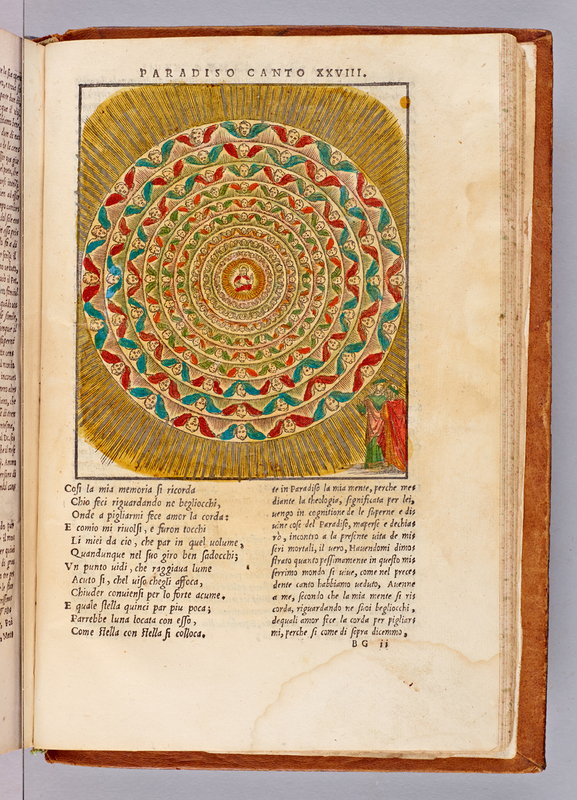 Dante describes the brief moment in which Beatrice pauses in her speech as like the moment in time when sun and moon are equidistant and perfectly poised on the horizon, before one moves up and the other down. We should pay attention to the word “punto”: in verse 4 it is used for a point of time, in verse 9 it refers to a point of space, and in verse 12 we find a conflation of time and space in the periphrasis for God as “là ’ve s’appunta ogni ubi e ogni quando” (where, in one point, all wheres and whens come to an end). Beatrice now discourses on creation, a theme that we find also in Paradiso 1, 2, 7, and 13. It is difficult for me to say which is my favorite creation discourse of Paradiso. These passages are all special, and contain some of the most sublime poetry of the third cantica. Eternal Love opened into new loves. The sublime verse “s’aperse in nuovi amor l’etterno amore” (Eternal love opened into new loves [Par. 29.18]) holds in balance the “new loves” and “Eternal love”. In the contrast between the eternal love and the new loves that it generates is all the splendor and pathos of created existence. Here we find in nuce the whole problematic of the novo. Although the “nuovi amor” are here positively charged, we remember the creation discourse of Paradiso 7, where we learned that free being is not subject to “la virtute de le cose nove” (the power of the new things [Par. 7.72]). How, and more importantly why, the eternal should give rise to the corruptible, the One should make way for the many, is the question posed in the dialectic between l’etterno amore and nuovi amori. not there until God moved upon these waters. The triple creation of form, matter, and their union knows no interval between inception and fulfillment (“che dal venire / a l’esser tutto non è intervallo” [Par. 29.26-27]), but takes its being all together and at once, “sanza distinzïone in essordire” (with no distinction in beginning ). Both Paradiso 28 and 29 are devoted to angelic intelligences, and thus, beginning in Paradiso 29.37, the creation discourse turns to the creation of angels. Beatrice moves, so to speak, into the topic of angelic “history”: here Beatrice treats the fall of Lucifer (from verse 55) and the grace/merit formula that applies to the virtuous angels. The question comes up, in verse 70, of those philosophers who mistake angelic nature, and Beatrice takes the opportunity to clarify that angels do not have memory, and why, in the extraordinary verses cited above (76-81). Since angels have no need for memory, they do not need to write, and they do not need to create poetry! The tone turns polemical in verse 82, and Beatrice moves into a condemnation of those preachers who instead of following Scripture go about inventing anything they want to invent— and who indeed lie (“e mente” in verse 100 = “and he lies”). Here we have the worst of human creativity. On the culture of preachers and Dante’s treatment of preachers in the Commedia, I recommend the excellent dissertation of Zane Mackin (Columbia, 2013). but, as before, Its own Self still is One. Aquinas poses the questions “does an angel know by discursive thinking” (“utrum angelus cognoscat discurrendo” [ST 1a.58.3]) and “does an angel know by distinguishing and combining concepts” (“utrum angeli intelligant componendo et dividendo” [ST 1a.58.4]). He points out that angels acquire knowledge intellectually, by intuiting first principles, whereas humans acquire knowledge rationally, through a discursive process: “Discursive thinking implies a sort of movement, and all movement is from a first point to a second one distinct from it” (“discursus quendam motum nominat. Omnis autem motus est de uno priori in aliud posterius” [ST 1a.58.3 ad. 1]),. Likewise, “just as an angel does not understand discursively, by syllogisms, so he does not understand by combining and distinguishing . . . For he sees manifold things in a simple way” (“Nihilominus tamen compositionem et divisionem enuntiationum intelligit, sicut et ratiocinationem syllogismorum, intelligit enim composita simpliciter” [ST 1a.58.4 co.]). Coordinated Reading: The Undivine Comedy, Chapter 10, “The Sacred Poem Is Forced to Jump: Closure and the Poetics of Enjambment,” pp. 237-40. See also Chapter 2, “Infernal Incipits: The Poetics of the New,” pp. 22-23. 9fiso nel punto che m’avëa vinto. 12là ’ve s’appunta ogne ubi e ogne quando. 18s’aperse in nuovi amor l’etterno amore. 21lo discorrer di Dio sovra quest’ acque. 24come d’arco tricordo tre saette. 36tal vime, che già mai non si divima. 45sanza sua perfezion fosser cotanto. 48nel tuo disïo già son tre ardori. 51turbò il suggetto d’i vostri alimenti. 54che mai da circüir non si diparte. 57da tutti i pesi del mondo costretto. 66secondo che l’affetto l’è aperto. 69mie son ricolte, sanz’ altro aiutorio. 75equivocando in sì fatta lettura. 84ma ne l’uno è più colpa e più vergogna. 87l’amor de l’apparenza e ’l suo pensiero! 90la divina Scrittura o quando è torta. 93chi umilmente con essa s’accosta. 96da’ predicanti e ’l Vangelio si tace. 102come a’ Giudei tale eclissi rispuose. 108e non le scusa non veder lo danno. 114de l’Evangelio fero scudo e lance. 117gonfia il cappuccio e più non si richiede. 123ad ogne promession si correrebbe. 126pagando di moneta sanza conio. 129sì che la via col tempo si raccorci. 138quanti son li splendori a chi s’appaia. 141diversamente in essa ferve e tepe. 145uno manendo in sé come davanti». intently at the Point that overwhelmed me. where, in one point, all whens and ubis end. as from a three—stringed bow, three arrows spring. distinction in beginning: all at once. with this, three flames of your desire are quenched. disturbed the lowest of your elements. never desert their circling contemplation. so that their will is constant and intact. grace, measured by the longing to receive it. much in regard to this consistory. by teaching that is so ambiguous. however, merits greater blame and shame. and thought of it so carry you astray! or the perversion of the Holy Scripture. pleasing is he who—humbly—holds it fast. of these—meanwhile the Gospels do not speak. but Spaniards, Indians, too, saw that eclipse. but to be blind to harm does not excuse them. who pay with counterfeit, illegal tender. our time is short—so, too, must be our path. thousands, he gives no number with precision. of love’s sweetness appears unequally. Fixedly at the point which had o’ercome me. E’en as three arrows from a three—stringed bow. They would perceive what pardons they confide in. 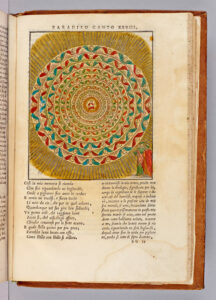 Beatrice explains the 9 rings of the Primum Mobile to Dante. 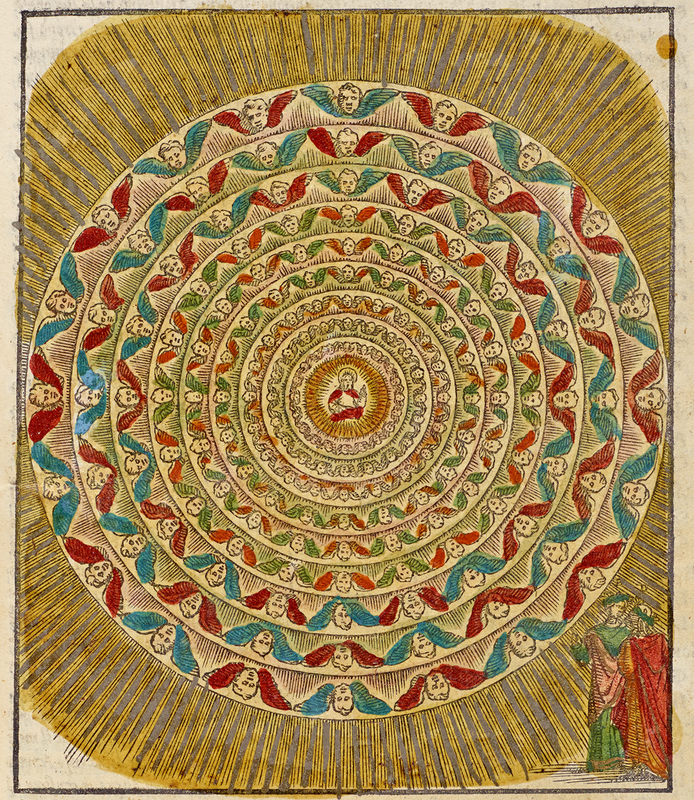 Starting from the center and moving outwards, she shows him the Seraphim, Cherubim, Thrones, Dominions, Virtues, Powers, Principalities, Archangels, and Angels.